With winter in full swing, you might not have air conditioner repairs on your mind, but now is the best time to take care of any issues with your home’s cooling system. By being proactive about A/C maintenance now, you’ll have your air conditioner ready to go at the first sign of warm weather. Making wintertime repairs to your A/C system can also save you on labor costs. Here are some common repairs you’ll want to take care of before the first sign of warm weather. The refrigerant circulating through your air conditioning system does not dissipate like other liquids and gases. However, a refrigerant leak can slowly empty your entire system of refrigerant. Low refrigerant levels can not only decrease your A/C system’s cooling abilities, but the resulting drop in pressure may also damage the compressor and other important A/C components. Before spring weather arrives, have your trusted HVAC technician check your air conditioner’s current refrigerant levels and look for leaks. Catching and repairing leaks early on can help preserve your A/C system’s performance and efficiency. 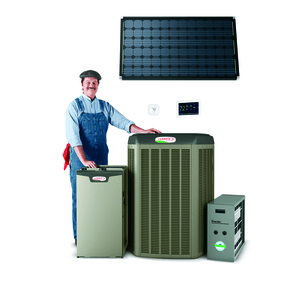 After finding and sealing the leaks, your technician can properly recharge the A/C system with new refrigerant. Worn-out relays, damaged contacts, exposed wiring and other electrical issues can easily prevent your A/C from working as it should when warm temperatures return. However, dealing with these electrical problems on your own could result in serious injury due to the electrocution risks involved. It’s best to have a trained and certified HVAC professional step in and safely complete the work. The blower fan motor plays an essential role in your air conditioning system. It not only draws in indoor air through the return air vents, but it also circulates conditioned air throughout the entire home. As with any other A/C system component, the blower fan motor requires occasional inspection and maintenance to ensure that it performs reliably. As a part of your air conditioner’s regularly scheduled maintenance, your HVAC technician will carefully inspect the blower fan motor for any signs of damage or overheating. If the electric motor requires lubrication, your technician will have the right tools and lubricant to take care the task and ensure the motor operates as it should. Your technician may also carefully inspect the blower fan blades for any signs of damage and carry out repairs or replacement as needed. The compressor lies at the heart of your A/C system. Without it, it would be impossible to keep your home cool. However, it’s all too common for homeowners to restart their A/C systems during the spring, only to run into compressor issues that prevent effective cooling. To keep this from happening to you and your household, it’s important to have your technician inspect the A/C system and make repairs before the arrival of spring. A dirty evaporator coil can cause a number of problems for your A/C system. For starters, dust, debris and mildew buildup can block airflow through the coil, preventing the A/C system from removing as much heat from your home as it normally does. Debris buildup can also cause condensation on the evaporator coil to freeze over, which can keep the A/C system from working. To keep your A/C system in good shape, you should have it professionally cleaned prior to restarting it for the spring and summer. Your HVAC technician will have the tools and expertise needed to remove dirt and debris from the evaporator coil. Your technician may also inspect the coil for any signs of damage and make repairs as needed. If your A/C system is in need of maintenance, visit the Lakeside Heating & A/C Inc. website and get in touch with us through our contact form.